Local Winthrop Author Robin G. Coles to present: Boating Secrets! Author Robin G. Coles will appear at Winthrop Public Library on February 1, 2012 at 6:00p.m., to give a talk on her first book Boating Secrets: 127 Top Tips to Help You Buy and Enjoy Your Boat! The program is free and open to the public. As Coles ventured out on her journey to become a better boater, she had many questions. She felt the best way to get answers was to interview experts in the field. As she prepared for these interviews she quickly realized it wasn’t just her struggling for this knowledge. In her book she tried to cover all the basics as well as some more advanced boating topics for the old salts. Coles’ book will not replace any classroom instruction, but promises to entertain through the use of amusing stories. This book is for both power and sail boaters. 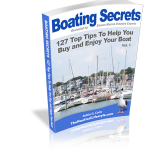 Robin G. Coles, author of Boating Secrets: 127 Top Tips to Help You Buy and Enjoy Your Boat will talk about her interviews with the eleven marine industry experts that helped her make this book a success. To order your copy goto BoatingSecrets.